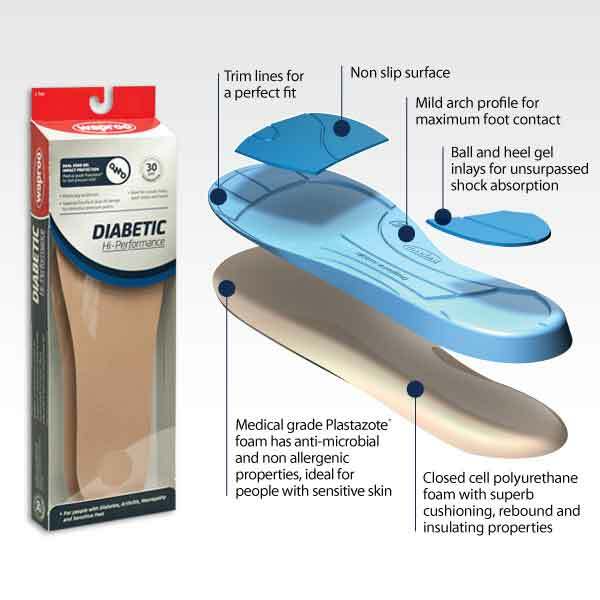 Designed to reduce foot friction and deliver superior comfort for Diabetics and people with sensitive feet, poor circulation and neuropathy. Dual zone impact protection. Slim fit. Large ball and heel cushioning gel inlays absorb and disperse damaging lower limb shockwaves during everyday activities, running and sports. Mild arch profile ensuring maximum foot contact for support. Alleviates heel and knee pain. Closed cell polyurethane foam provides superior cushioning, rebound and insulating properties. 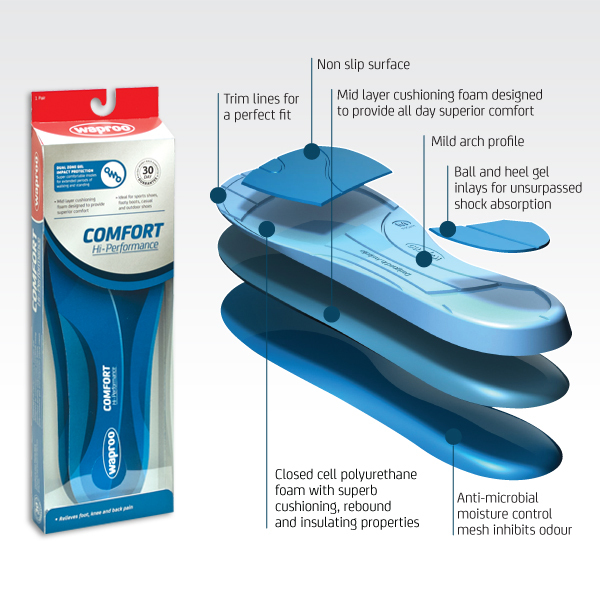 Air circulation channels in undercarriage of insole encourages cooling air flow and breathability. 5 different sizes plus additional trim lines for a more custom and ergonomic fit. The large ball heel cushioning inlays absorb and disperse damaging lower limb shockwaves during everyday activities, running and sports. An orthotic style insoles designed to deliver moderate arch support and heel stability for added comfort and to alleviate Over Pronation, Dual zone gel impact protection. Slim fit. Orthotic style stabiliser gently supports the arch and rear foot to control over pronation and improve bio mechanical performance. 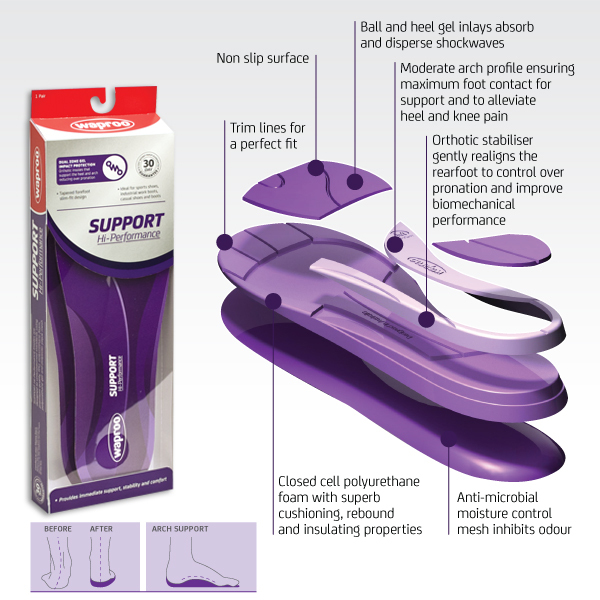 Medium arch profile for extra support to alleviates heel and knee pain. Has large ball and heel cushioning gel inlays which absorbes and disperse damaging lower limb shockwaves during high impact activity. Design to improve over protenationwith built in orthotic style stabiliser. Moderate arch profile for additional Support, Stability and Comfort. Designed to deliver ALL DAY SUPERIOR COMFORT for extended periods of standing and walking. Ideal for people who work in retail, factores, hospitals, construction etc. Dual zone gel impact protection. Slim fit. Tapered forefoot slim fit design ideal for footy boots, casual shoes, sports shoes and outdoor shoes. 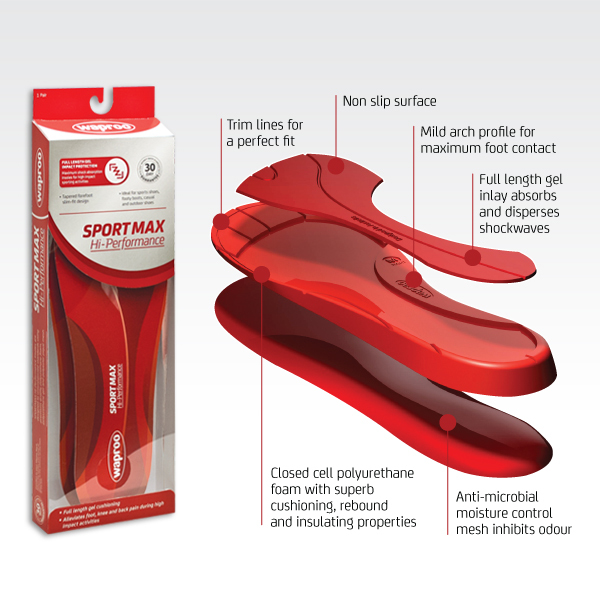 An innovative and uniquely superior sports insole designed to deliver UNSURPASSED CUSHIONING and PROTECTION during high impact sporting activities. Full length gel impact protection. Slim fit. chaffing and soreness in your feet.